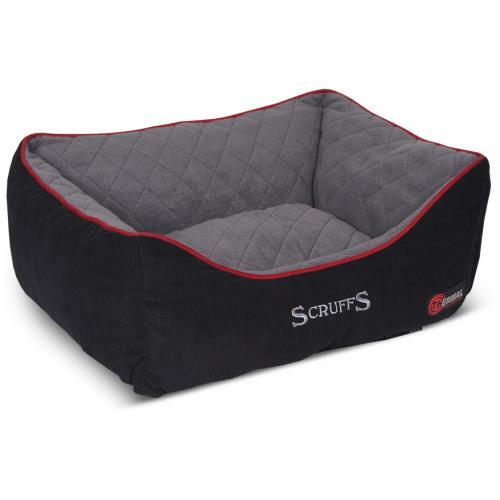 Scruffs Thermal Box Dog Bed in Black is the ideal choice to keep your pet warm. Scruffs Self Heating beds have an advanced construction designed to efficiently reflect your pet's heat keeping them warm and comfortable all year round. Self heating pet beds are great for pets who suffer from arthritis, young and ill pets or just those that enjoy the extra warmth. Each bed contains a foam layer, backed with reflective foil. This layer is sandwiched between quilted polyester fibres and the beds main fill. The quilted polyester lies beneath a super soft fleece cover which is great for trapping warm air around your pet, providing added insulation.